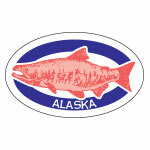 The Alaska Salmon cap is o-fish-ally available! Represent your favorite state with this awesome cap. 250 caps per pack.